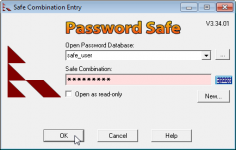 Password Safe is a simple application that manages the passwords in a database offering access to them by providing only a master password. Password Safe allows you to manage all your passwords and user names safely and only having to remember one master password. It brings all the passwords in a database and the storage is completely secure because the data is encrypted. This way the user does not have to keep the passwords written on papers, keeping them exposed. It also helps him to have individual password for each application that requires it because having one password would compromise the security of the documents, email accounts, bank accounts, work etc. Password Safe is your passwords guardian offering a very convenient way to store and manage your passwords especially if you are dealing with many important accounts that requires remembering passwords. It is advisable to keep in mind all your passwords but if the number of your password overcomes your memory, keeping in mind just ONE master password that offers the access to the rest of your password is a great solution. 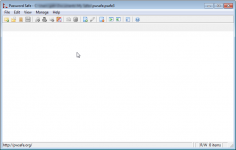 - It has a clear layout being very easy to use. - work on more operating system as at the moment it only works on Windows OS. We also have a suggestion for the user: not to reveal the master password because all your secured passwords will become unsecure - but this is up to you.